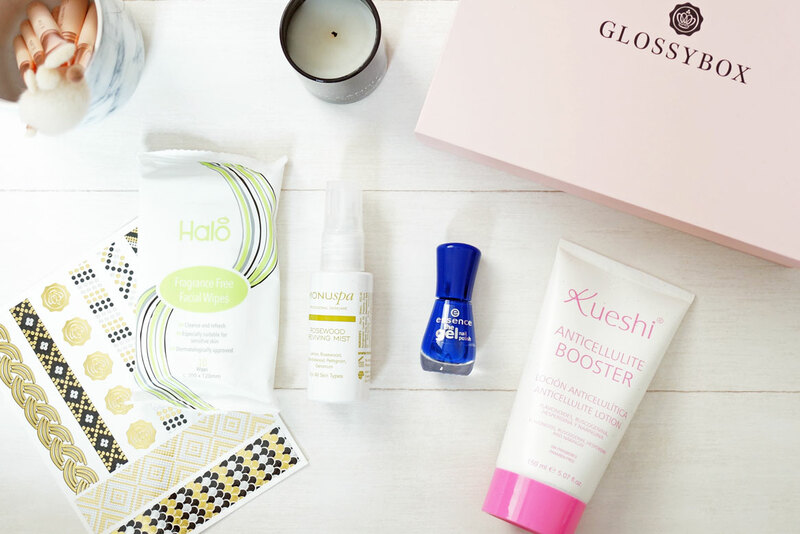 Ok so on first glance, this is probably not the most exciting box Glossybox has come up with, but it does contain a good varied range of products to try out. So first up I’ll start with the Essence Nail polish in 31 Electriiiiiic, I’m a big fan of blue nail shades so this definitely caught my eye. 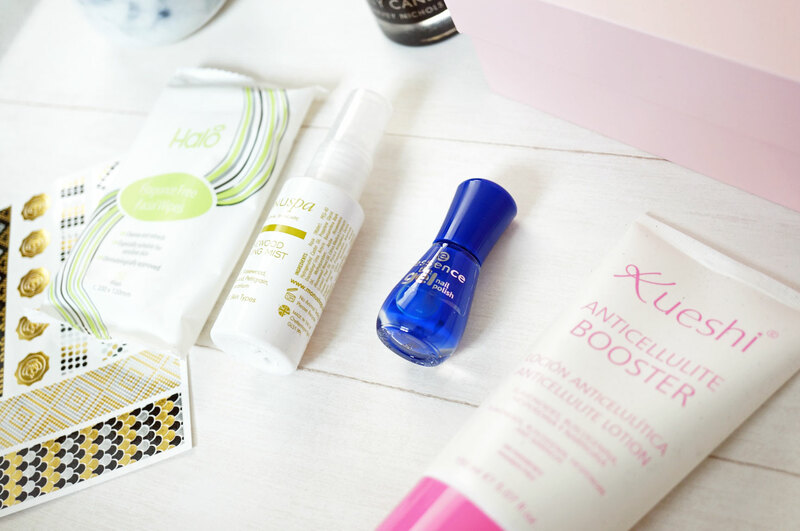 Essence is one of those brands I’ve been wanting to try but haven’t had a chance as they’re not stocked near me – I’m pretty sure their products are available in Wilko? Anyway, this polish is a gorgeous shade, and comes with a wide brush which is great to see, so application is easy, and it took me three coats to get full opacity. For under £2 this is a great little polish! Jumping to a product at the other end of the spectrum that doesn’t really appeal to me – the Kueshi Anticellulite Booster is supposed to combat existing cellulite whilst preventing the formulation of new cellulite using flavenoids to inhibit the formation of fat cells, ruscogenin to facilitate blood flow, and naringin and rutin to reduce swelling. It has a light, pleasant fragrance, and the texture is similar to a light moisturiser. I personally don’t believe anti-cellulite creams work. I’ll give this a go though and will definitely report back if it does! Next up is the Monu Spa Rosewood Reviving Mist, this has been created using a blend of zesty essential oils from Lemon and Rosewood to Sandalwood, Petitgrain, Geranium and Clary Sage, to leave skin feeling cool and refreshed whilst providing an irresistible fragrance to tantalise the senses. You can use this spray to instantly refresh tired skin as well as to set your makeup. I don’t often use facial sprays but this has a really nice fresh scent – I think I might also keep it in the fridge for extra refreshment! The Halo Fragrance Free Facial Wipes come in a handy mini pack of ten, which is perfect for your handbag. They are obviously fragrance free, and also suitable for sensitive skin. I was impressed that they removed all my makeup with minimal rubbing – including eyeliner and mascara. These would definitely be a must have if you’re heading off to a festival this summer. And lastly Glossybox’s own brand of flash temporary tattoos. I’ve actually been wanting to get my hands on some of these gold and silver tattoos, I’ve seen them in many an Instagram snap sported by bronzed Goddesses and I think they look great! There are eight strips of tattoos here which you can cut up and place on your body as required – one row of them being the Glossybox crown logo in gold, if you fancy wearing that on your body! These tatts are really easy to use, you just press on your skin, cover the back with water and peel the backing off. They’re not going to be everybody’s cup of tea but I think they’re pretty cool! Very cool, great post. Enjoy the week, dear. Love the look of the nail polish and that is such a great price!